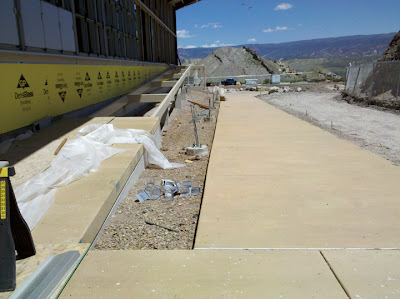 One of the improvements in the new Quarry Visitor Center is that the mezzanine will be wider. This will allow visitors to get much closer to the quarry at mid-height and so better see the multitude of bones along the top and center of the sandstone face. But nothing comes without a price, in this case smaller working space. As constant readers will recall, last summer we removed the 14,000 pound moveable crane from the building because it was no longer safe to operate. 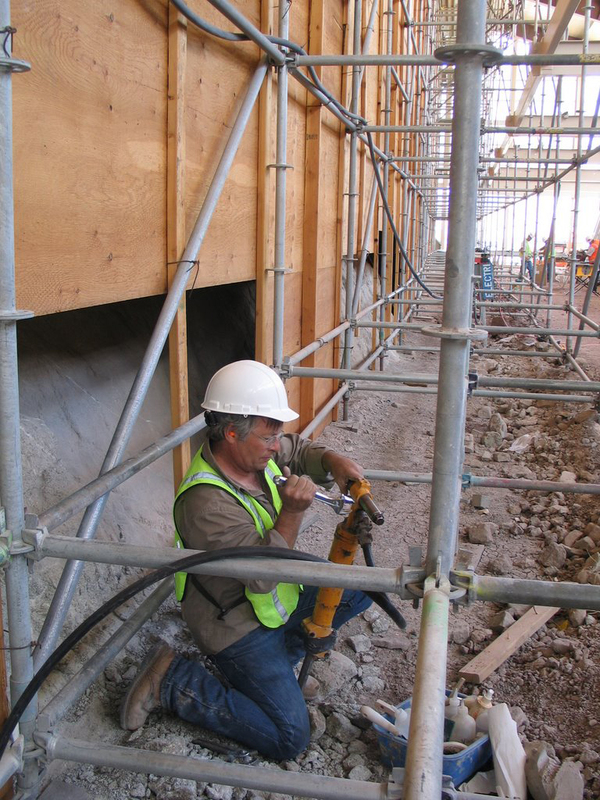 In the new building we will use some sort of extending lift with a basket to reach the more inaccessible higher parts of the cliff for cleaning, conservation, and research. The widened mezzanine lessened the space available for the crane, so anything that can buy us some space would help with that problem. The outer surface of the sandstone is irregular, with some portions jutting out further than others. 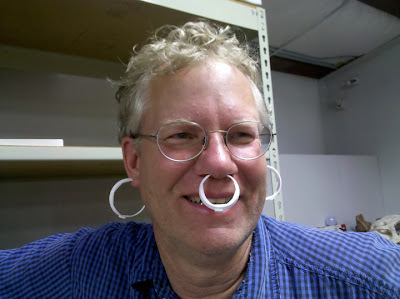 Those parts that haven’t been excavated down to the bone layer jut out at ground level, like the toe of the face. 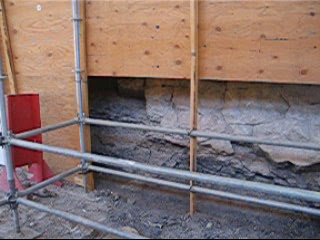 Areas excavated all the way back to the main bone layer do not stick out. By removing the toe we can move the face back about 12 inches in the most critical areas, buying some room for the wheels and body of the lift to operate in. To get this done, some of the bottom sheets of plywood of the sarcophagus were removed, providing access to the toe. Paleontologists Dr.Brooks Britt and Dr. Rod Scheetz, of Brigham Young University, helped us with the excavation. 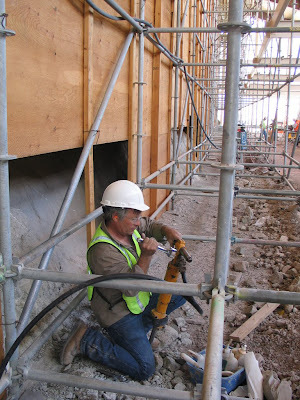 Pneumatic chisels and drills were employed, although their use was complicated by the fact that Rod and Brooks needed to work in and around the metal scaffolding that forms the support for the sarcophagus. After a few days of struggle about 30 feet of the toe was cut back 12-15 inches. Every inch counts! With this work completed the plywood was put back up. 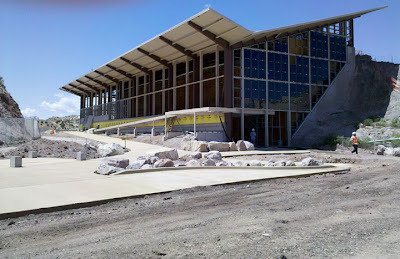 Work continues in getting the glass completely installed in the walls. Once that is completed, the next big step will be the dismantling of the scaffolding and plywood sarcophagus, allowing sunlight onto the quarry face for the first time in 18 months. 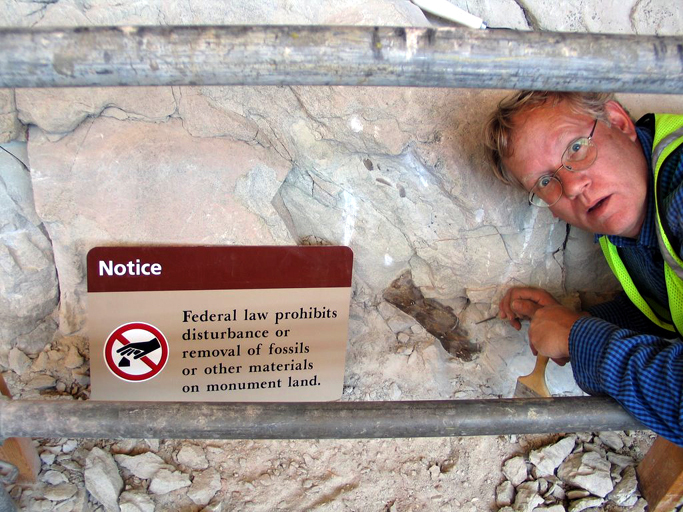 Yes, he may be a paleontologist with a Ph.D. but Brooks still has to abide by the rules, or else. Before becoming a paleontologist, Brooks Britt was the drummer in the moderately successful punk rock / Lawrence Welk polka music fusion band called The Provo Accordion Cannibals. Work progresses slowly on the installation of the framing and windows, with about ¾ of the windows now in. However, the pouring of concrete around the Quarry Visitor Center is completed. 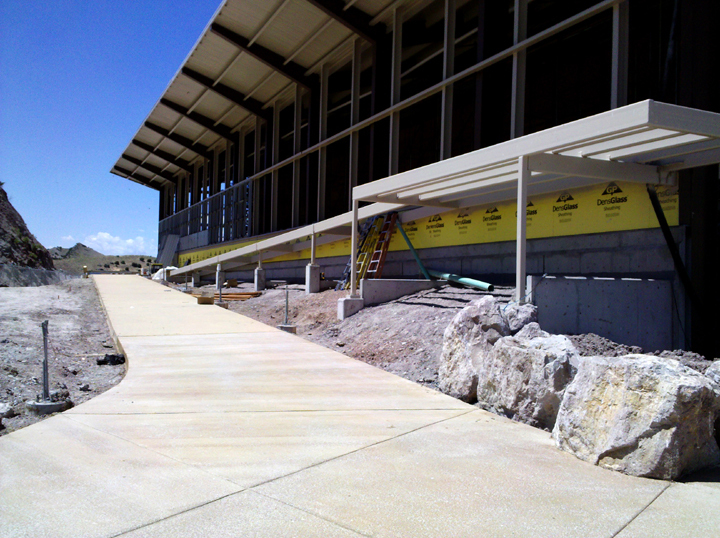 A long, wide walkway leads from the parking lot to the base of the entrance ramp that runs up and along the south wall of the building. Sidewalks and curbs connect that walkway with the exit doors, visitor shelter, and restrooms. 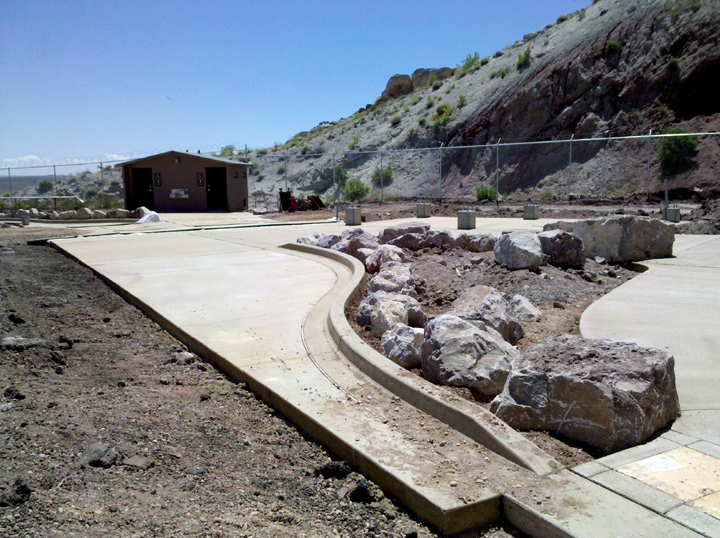 Decorative landscaping blocks, some with Thalassinoides trace fossils, are in place. 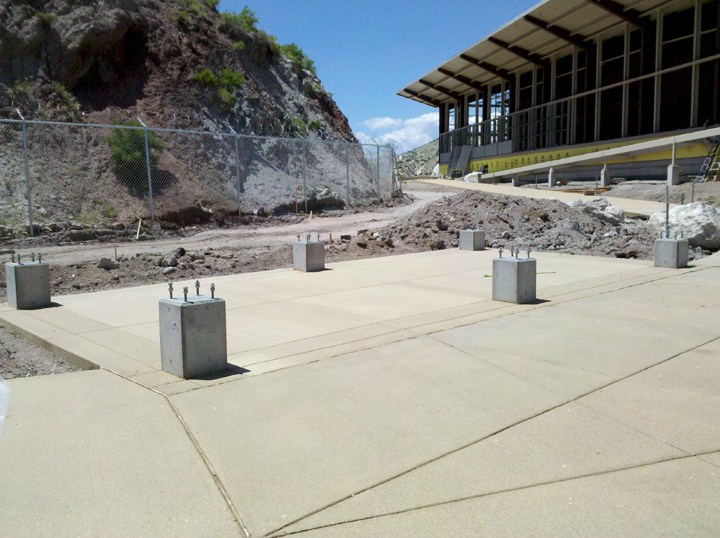 These concrete blocks are the bases for the beams that will support the roof of a shade structure where visitors can comfortably wait for the shuttle bus. There is a saying about ancient Rome that “All roads lead to Rome.” There is a similar truth for Dinosaur National Monument, where all roads lead to the Quarry Visitor Center, although getting to the Carnegie Quarry from the Echo Park campground deep in the Monument’s river canyons may take some creative route finding.